Commercial food equipment service and part distributors, driven to exceed your expectations! 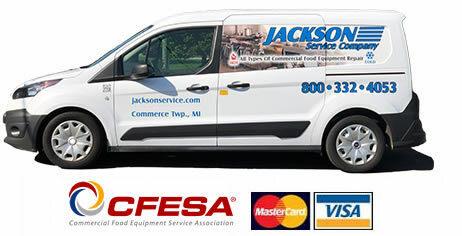 Jackson Service Company, is a leader in food service equipment repair in and around Michigan. We keep equipment running efficiently all over the nine county region outside of Detroit including Livingston, Oakland, Macomb, Wayne, Genesse, Lapeer, Washington, Monroe & St. Clair You can depend on our highly skilled technicians to fix your equipment right the first time, and provide reliable service when you need it the most! Extend the life of your current equipment! Our goal is to help you protect your investment with top-notch repair and notable response time. We want to save you TIME and MONEY. Providing service, parts, equipment installation, removal and disposal of used equipment, on-site stainless steel welding, fabrication and water filtration systems for commercial cooking equipment and refrigeration units. Competitively-priced replacement parts shipped daily. Call today for a quote.